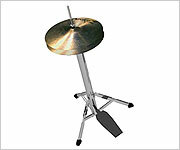 The hi-hat is made up of two cymbals, with one on top of the other. They both sit together on a stand which can be operated by a foot pedal. You can play the hi-hats by striking them with a stick, normally with the foot depressed and the cymbals close together. They are also played by closing them together with the foot, or by striking and opening at the same time (used a lot for disco / house grooves). 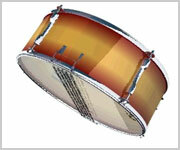 The snare drum has a number of strands of metal wire across the bottom head, which resonate against the bottom head (drum skin) when the drum is struck. The strand of wires is called a snare hence the name of the drum. The snare drum can be played by striking the drum’s top skin, or by catching the rim at the same time, called a rim-shot. Furthermore, you can lay the stick across the drum and chop down on the rim’s edge. This latter technique is often called cross stick, or stick across. 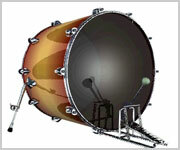 The deepest drum in the kit, the bass drum, lies on the floor and is operated exclusively by a foot pedal. The bass, snare and hi-hat work together in rock and pop music at the centre of grooves and the control of these three voices is a large part of developing three way co-ordination.